Nor-Cal frequently provides custom and modified standard isolation valves to meet our customer’s specific requirements. 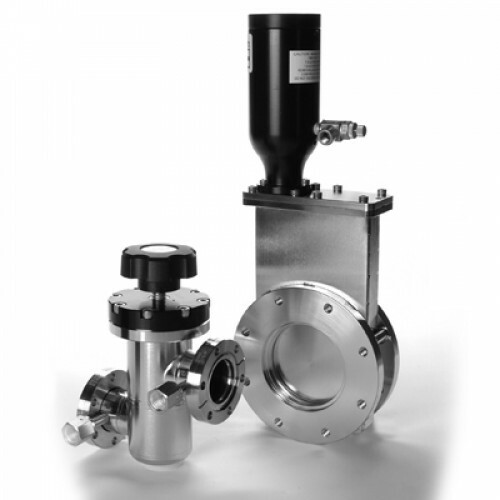 Single or multiple valves can be integrated with manifolds, chambers and other components. Many special features can be specified by adding options. Our new ball valves are a low cost, manually or pneumatically operated, straight through isolation device. Their simple, robust design provides high reliability in “dirty” applications. They are commonly used on MOCVD and CVD equipment downstream from the chamber or vacuum pump to isolate traps or abatement tools. A stainless steel body and Teflon seat make these valves ideal for corrosive environments. A quarter turn of the handle quickly switches the valve from open to close. Heater jackets are available to reduce process by-product accumulation.